The General Page provides miscellaneous configuration options. 1. Max Compile Errors. This item specifies the maximum number of errors before the compiler stops compiling. Usually this is set to a small number because you only need to see the first few errors to locate the place where you need to start debugging. In addition, one error can cause a cascade of erroneous errors that aren't useful. However, there are times when you want to see a larger number of errors. Increasing the Max Compile Errors value will do that. 2. Auto-Include Intrinsics. When this option is enabled, the Compiler automatically inserts an intrinsic file into the input stream. This allows programs to be written without an explicit code declaration, using a default set of intrinsics. 3. Use Intrinsic Prototypes. 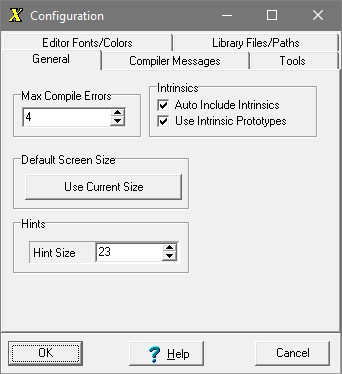 When this option is enabled, the program includes a intrinsic prototypes which allow the compiler to test each intrinsic all for the right type and number of arguments. 4. Default Screen Size. This option controls the screen-size of EXPL IDE window when the program first starts. To set the default size, simply adjust the window to the size you want and then press the "Use Current Size" button. The size will be saved and the next time the program runs, the program will start with the window set to the saved width and height.